Here is the complete bracket for our Best Sports Jersey Podcast. Be sure to watch our podcast below where the jersey professional Nic Civale and I go over each first round matchup and give our predictions for who we think should win. HOW TO VOTE: Use the hashtag #BestSportsJersey and then list the teams you want to vote for in the first round. First round voting will close Tuesday, 8/19 at noon. 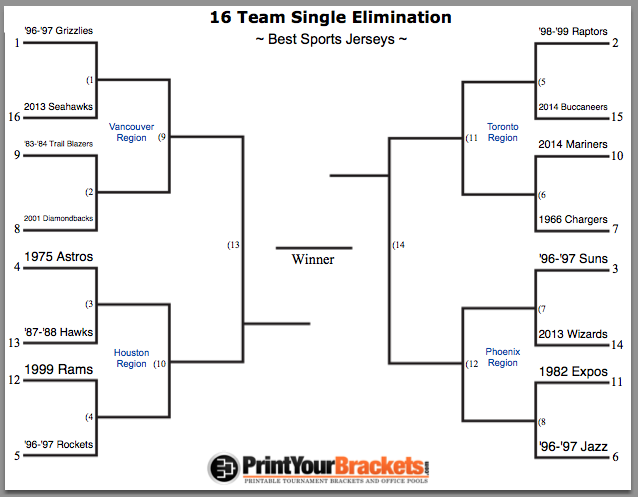 The anticipated Best Sports Jersey Bracket is revealed for you to vote on. Also we talk about Kevin Love to the Cavs, Team USA’s chances against Spain, some (fantasy) football and the Red Sox trading of Jon Lester. This entry was posted in Home and tagged Best Sports Jersey's Bracket, Podcast. Bookmark the permalink.